Product code: Q210cc Categories: Sold Items, Sold Watches. 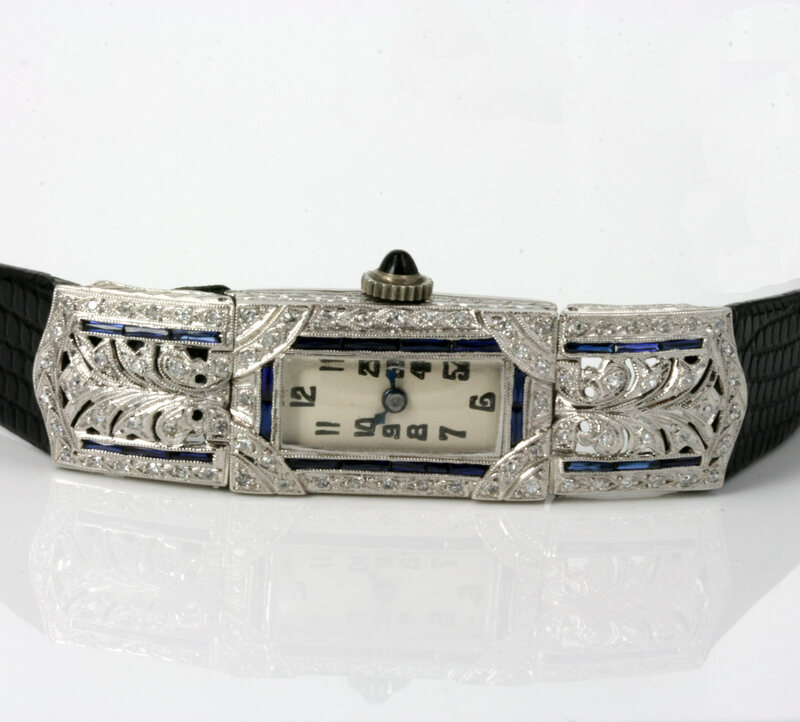 Here is a ladies vintage wrist watch from the Art Deco period that is a piece of jewellery just as much as a watch and looks superb on the wrist thanks to the sapphires, diamonds and design of the watch case. Made around 1930 both the case and each ends are made entirely from platinum which was the metal of choice for many jewellers of the Art Deco period. The design of the case alone is so typical of what you would expect from a fine quality Art Deco watch, and the diamonds are not simply surrounding the case, but wonderfully overlap on the corners and are milgrain set with that fine crimping along the sides. There are a total of 28 diamonds on the case, then there is the border of rectangular cut blue sapphires that look magnificent set against the pure white of the platinum and along side the diamonds. At each end, there are those wonderful platinum diamond and sapphire set ends that really makes this into a stunning piece of Art Deco jewellery in its own right. Each end is set with 25 more diamonds and 6 sapphires again in this magnificent design that only the Art Deco era jewellers could achieve. The sides of the case and ends haven’t gone untouched as they have all been expertly hand engraved as has the back of the watch which adds that extra bit of elegance to an already fine Art Deco wrist watch. 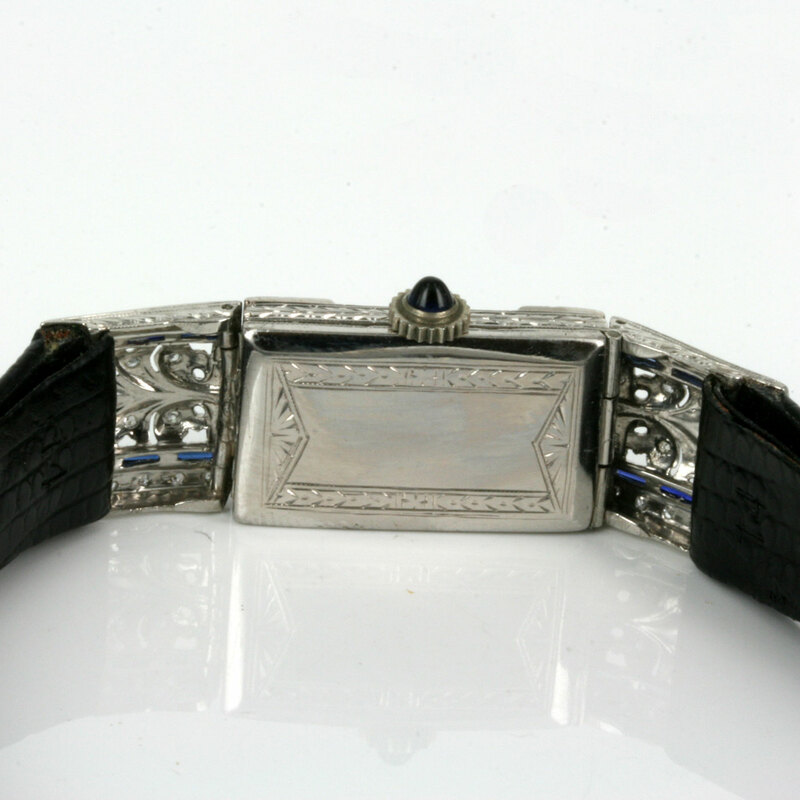 From end to end the case and ends measure an impressive 5.3cm long by 1.4cm wide (plus the crown) and the middle section alone measures 2.3cm in length and this Art Deco watch wraps around the wrist so elegantly. Inside is a 17 jewelled manual wind movement by the Swiss firm Frey & Co which started production at the end of World War I in 1918 and the movement runs great and comes with our one year warranty. There is something so special about Art Deco watches and Art Deco bracelets and here you really have a combination of the two with a fine Art Deco sapphire and diamond watch that stands out so well day or night.